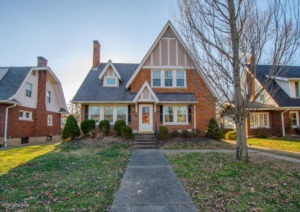 Lovely Tudor style home is located in a wonderful neightborhood, close to Lakeside, Cherokee Park, and Bardstown Rd. You will love the hardwood floors throughout the home. The Living room features a fireplace. Kitchen has been updated, offers ample space, and has stainless steel appliances. Large dining room is a great place for entertaining. Upstairs offers 2 of the 3 bedrooms (one on the 1st floor), and 2 flex spaces. Beautiful updated bathrooms. The backyard has a brick patio and is fenced. The exterior was repainted in 2014. Double-paned, insulated windows have been installed. Click to schedule your showing.